Quincy Carpenter and five of her friends were celebrating a birthday at Pine Cottage, but things didn't go as planned and only Quincy made it out of there alive. 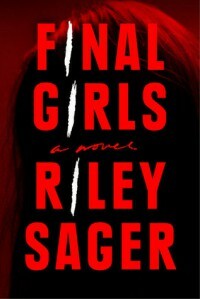 That was ten years ago, but she will always be a member of a club she does not want to belong to - the Final Girls. Lisa lost nine sorority sisters and Sam was the only survivor during her shift at the Nightlight Inn. Despite the media's attempts the three never meet in person. Quincy is doing well. She has an understanding and supportive boyfriend, they live together in a beautiful apartment, she runs a popular baking blog, and the police officer that saved her life is still there for her any time of day or night. And she'll need him when she learns that Lisa has committed suicide and Sam comes out of hiding and shows up at her door. Since Quincy never could remember the details of what happened that night in the woods, Sam is intent on making her relive the past so those memories finally come to light. I had to sit and think about what I'd read for a day afterwards. I really enjoyed the writing. I liked how we got a glimpse here and there about that night at Pine Cottage. And when I finally got to the big reveal I wasn't disappointed. I thought the story was clever. So many secrets and lies. I made some guesses at what could've happened but (of course) I was wrong. I felt like maybe there was too much in the middle - Sam shows up and we get lots of Sam and Quincy spending time together. But overall I really enjoyed this book.